Are you still struggling to understand this new and evolving world of gender identity? 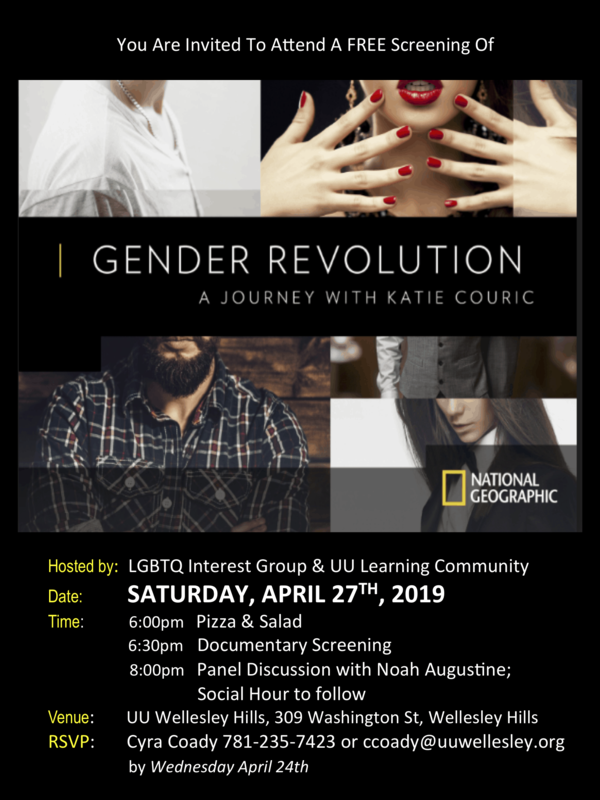 Please join Wellesley Hills UU for a free pizza dinner, followed by a showing of “Gender Revolution: A Journey with Katie Couric.” This 2017 documentary explores the differences between gender and sexual orientation, gender expression and gender identity, and illuminates some of our new understanding of the role of genes and hormones and gender confirmation surgery. After the movie, Noah Augustine, a member of the trans community, will share some of his own experiences and will answer questions. Hosted by our partner Wellesley Hills UU. 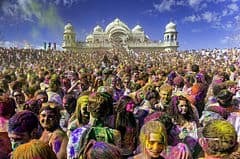 Holi, famously known as the “Festival of Colors”, is celebrated by people of South Asian origin to welcome the new season, Spring. The Wellesley South Asians Holi planning committee would like to invite you and your family to the WSA Holi 2019. This year, the celebration will be held at the VFW Hall in Needham on Sunday, Apr 28 from 11.30 to 2.30 pm. There will be a catered Indian lunch, Bollywood music, dancing, and dry colors to play Holi with, a cultural entertainment program and more- all for $25 per person; kids 5 yrs and under are free. To purchase tickets please email: WSAHoliGroup@gmail.com. Tickets need to be pre-purchased. As we know all too well, the United States is facing a crisis of mass incarceration with more than 2.2 million people packed into its jails and prisons. Please join us on APRIL 7th for a special screening of Rikers: An American Jail , a riveting documentary from Bill Moyers that focuses on former detainees whose searing testimonials describe the deep-seated culture of systemic violence and corruption that has plagued the notorious NYC jail for decades. Featured in the documentary is Rev. 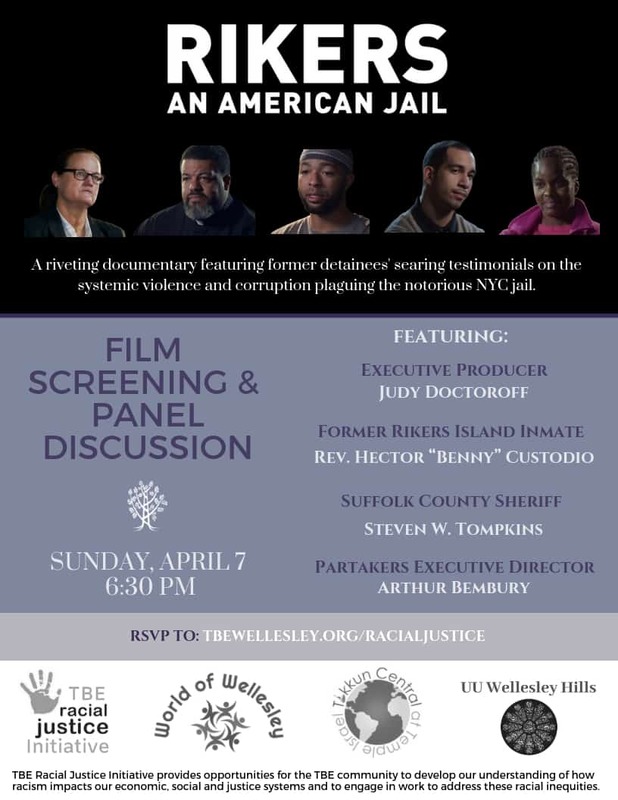 Hector “Benny” Custodio who will join us for a discussion following the film as well as Suffolk County Sheriff Steven W. Tompkins and Partakers Executive Director Arthur Bembury. Judy Doctoroff, Executive Producer of the film will moderate this distinguished panel as we explore the crisis of mass incarceration. Hosted by Temple Beth Elohim’s Racial Justice Initiative and co-sponsored by Temple Israel, UU Wellesley Hills and World of Wellesley. 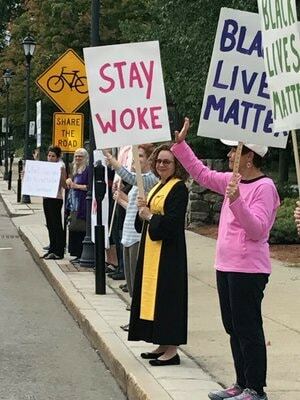 Members of the UU Wellesley Hills Advocacy & Witness Interest Group invite you to stand with us against white supremacy and for racial justice and human rights. We hold a 15 minute silent vigil in recognition that Black Lives Matter each month, on the first Sunday at 12:30 pm. We gather in the UU Wellesley Hills courtyard and proceed together to the sidewalk in front of UU Wellesley Hills. We believe that holding such a vigil will ignite important conversation about white supremacy and institutional racism within our community. Hosted by our partner UU Wellesley Hills. Join us in a thought-provoking community conversation about the challenges of living in Massachusetts as a transgender person, viewed from several different perspectives. What are the trans rights currently in place? What would be the threat to trans rights if the current law is not upheld by a Yes vote for Question 3 on the November 6th ballot? Panel moderated by Michelle Chalmers, President, World of Wellesley. A question and answer period will follow speakers’ remarks.